Health sector services are concerned with promoting, restoring and maintaining a healthy society with the objective that Australians are born and remain healthy. They involve illness prevention, health promotion, the detection and treatment of illness and injury, and the rehabilitation and palliative care of individuals who experience illness and injury. Includes general practice, pharmaceutical services, dentistry, allied health services, maternal and child health, alcohol and drug treatment and other services. Includes responding and treating out-of-hospital medical emergencies. Includes care provided to admitted and non-admitted patients, including acute and non-acute care and mental health services. Includes MBS-subsidised mental health services provided by primary and community health providers, State and Territory government specialised mental health services and non-government services providing community-based support. Other major areas of government involvement in health provision not covered in the health chapters, or elsewhere in the Report, include public health programs, other than those for mental health, and funding for specialist medical practitioners. Detailed information on the equity, effectiveness and efficiency of service provision and the achievement of outcomes for the primary and community health, ambulance, public hospital and mental health management service areas is contained in the service-specific chapters. Note: Attachment tables are referenced by table xA.1, xA.2, etc, with x referring to the chapter or overview. For example, table EA.1 refers to attachment table 1 for this sector overview. Total Australian, State and Territory government recurrent expenditure on health services was estimated to be $103.3 billion in 2016-17, around 43.9 per cent of total government expenditure on services covered in this Report. Public hospitals was the largest contributor ($63.8 billion, table 12A.1), followed by primary and community health ($36.9 billion, table 10A.1 and ambulance services ($2.6 billion (in 2017-18), table 11A.1). Expenditure for mental health management was $8.7 billion in 2016-17 (table 13A.1); however, as much of this expenditure is already captured in the public hospital and primary community health expenditure it is not included in the health expenditure total to avoid double counting. 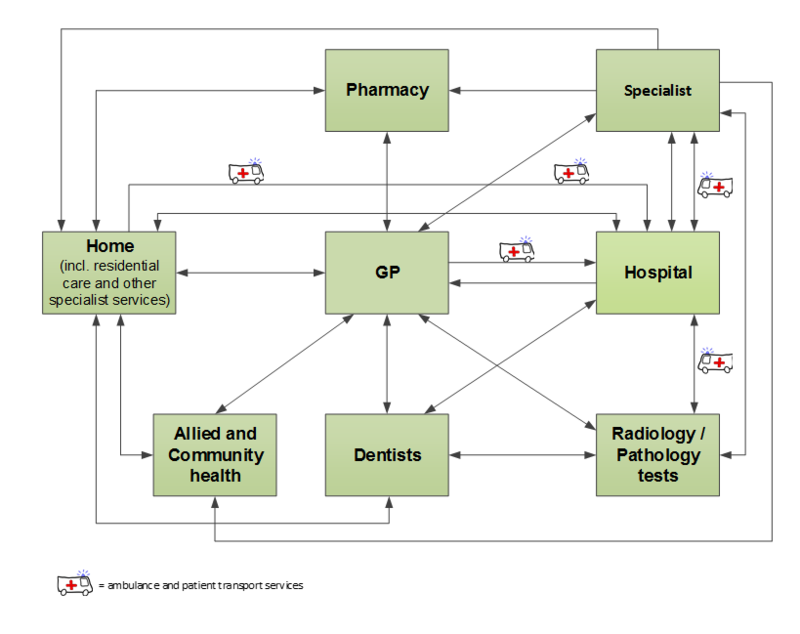 Health services in Australia are delivered by a variety of government and non‑government providers in a range of service settings that do not have a clearly defined path (figure E.1). The most common entry points to the health system in Australia are predominantly via primary and community health services. Ambulance services and public hospital emergency departments can also be first points of contact. Some patients may then progress through the system to become non-admitted or admitted hospital patients (including specialist mental health care) or medical specialist patients. Often a number of cycles of care through various points in the system are required to treat a condition. Finally, some patients will require rehabilitation provided by hospitals or primary and community health services. Four sector-wide indicators of governments’ objective that Australians are born and remain healthy are reported. Key risk factors affecting the outcomes of these indicators include overweight/obesity, smoking and risky alcohol consumption (data on these risk factors are available in tables EA.3, EA.7 and EA.9). In 2016, 5.1 per cent of babies born in Australia were of low birth weight (table EA.2). The proportion with low birth weight born to Aboriginal and Torres Strait Islander mothers was more than twice that for babies born to non-Indigenous mothers (figure E.2). Data on the Indigenous status of the baby is available in table EA.1. a See table EA.2 for detailed definitions, footnotes and caveats. Source: AIHW (unpublished) National Perinatal Data Collection; table EA.2. Selected potentially preventable diseases relate to diseases that could have potentially been prevented through the provision of health interventions and early disease management. Diseases covered in this report include selected cancers, heart attacks and type 2 diabetes. Nationally in 2015 (excluding NSW), the age standardised rate of new cases for selected cancers was highest for female breast cancer (124.2 per 100 000 females), followed by bowel cancer, melanoma and lung cancer (57.0, 52.5 and 42.4 per 100 000 population respectively) and lowest for cervical cancer (6.8 per 100 000 females) (table EA.11). Data for 2016 were available for Victoria only. Nationally, the rate of heart attacks (acute coronary events) was 336.2 cases per 100 000 people in 2016 (table EA.14). The national rate has decreased each year over the 10 years included in this Report, including for males. For females, the rate decreased every year until 2015, before increasing in 2016. However, the rate for females is still less than half the rate for males. Nationally in 2011-12, an estimated 4.3 per cent of adults had type 2 diabetes, with rates higher for males compared with females (table EA.23). The average life expectancy at birth in the period 1901–1910 was 55.2 years for males and 58.8 years for females.2 It has risen steadily in each decade since, reaching 80.5 years for males and 84.6 years for females in 2015–2017 (table EA.29). The life expectancies of Aboriginal and Torres Strait Islander Australians are considerably lower than those of other Australians with a life expectancy at birth of 71.6 years for Aboriginal and Torres Strait Islander males and 75.6 years for Aboriginal and Torres Strait Islander females born 2015–2017. In the same time period, life expectancy at birth for non‑Indigenous males was 80.2 years and for non‑Indigenous females was 83.4 years (table EA.30). The national age standardised mortality rate, measured in deaths per 100 000 people, was 528.4 in 2017 — a decrease from 533.6 in 2016 (figure E.3) and the lowest rate for the 10 years of data included in this report (table EA.31). In line with life expectancy data, mortality rates are higher for Aboriginal and Torres Strait Islander Australians compared to non-Indigenous Australians, though the 2017 rate is the lowest for the 5 years of data included in this report (table EA.32). a See table EA.31 for detailed definitions, footnotes and caveats. Source: ABS (unpublished) Deaths, Australia, Cat. no. 3302.0; ABS 2016, Australian Demographic Statistics, Cat. no. 3001.0; table EA.31. Mortality data are separately reported for children for perinatal deaths (fetal deaths [still births] and neonatal deaths [death of an infant within 28 days of birth]), infant deaths (children aged 0<1 year) and infant and child deaths (children aged 0<5 years). There were 8.1 perinatal deaths per 1000 births (table EA.41) in 2017, of which around 70 per cent were fetal deaths and the remainder neonatal deaths (tables EA.39–41). Over the last 10 years, the annual infant mortality rate in Australia has ranged from an average of 3.1 deaths per 1000 live births (2016) to 4.2 deaths per 1000 live births (2009), and was 3.3 deaths per 1000 live births in 2017 (table EA.33). The Australian infant and child combined mortality rate (3-year average) has decreased over time from 105.9 deaths per 100 000 population in 2007–2009 to 76.3 deaths per 100 000 population in 2015–2017 (table EA.35). The most common causes of death among all Australians in 2017 were cancers and diseases of the circulatory system (including heart disease, heart attack and stroke), through rates for both have reduced significantly from 2008 (table EA.37). Data by Indigenous status are available in table EA.38. Many deaths can potentially be prevented through individualised care and/or are treatable through existing primary or hospital care. Nationally, there were 102.7 potentially avoidable deaths per 100 000 people in 2017 — the lowest rate for the 11 years of data in this Report (table EA.26). The rate of potentially avoidable deaths in 2013–2017 for Aboriginal and Torres Strait Islander people was more than three times the rate for other Australians, but similar to the total population is the lowest rate for 11 years of data in this Report (table EA.27). These attachment tables relate to the sector as a whole. Data specific to individual service areas are in the attachment tables under the relevant service area. See the Sector overview text and corresponding table number in the Attachment tables above for detailed definitions, caveats, footnotes and data source(s).